After a nine-month engagement, Pippa Middleton and James Matthews are officially married! The couple tied the knot on Saturday during an intimate ceremony at St. Mark’s in Englefield, the Middleton’s hometown church. Reverend Nick Wynne-Jones, the resident priest at St Mark's, officiated the service, which gathered around 120 close family and friends. Despite the gloomy weather, Pippa maintained high spirits, looking positively ecstatic as she arrived at the church to marry her fiancé of nine months. The 35-year-old didn't disappoint as she made her grand entrance on the arm of her father, Michael Middleton, after stepping out of a vintage car. 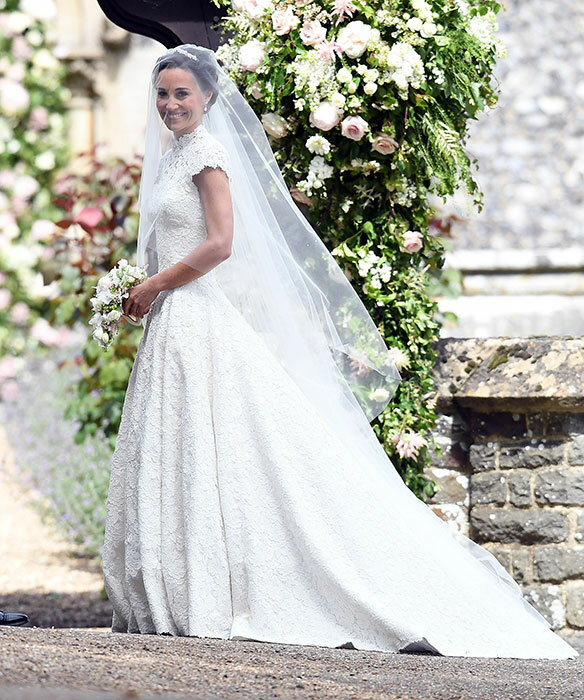 Pippa made for a picture perfect bride, draped in a stunning white lace gown by British fashion designer Giles Deacon. Onlookers were blown away by her very traditional look, which included a long train and bespoke veil. The veil was designed by milliner Stephen Jones, boasting embroidered pearls and tulle. She also donned a tiara handmade by Robinson Pelham and ivory satin Manolo Blahnik pumps. The beauty had her brunette hair swept up into an elegant chignon and a huge smile spread across her face. Among tufts of guests, was the bride's older sister Kate Middleton with her husband Prince William. The Duchess of Cambridge, who looked pretty in a peach Alexander McQueen dress, played a pivotal role on her sister’s big day, offering support and assistance to her behind the scenes. The 35-year-old was also on hand to help her children, who were assigned integral wedding duties. Doting Aunty Pippa gave her niece Princess Charlotte and nephew Prince George starring roles. Charlotte, who recently turned two, accompanied Pippa down the aisle as a bridesmaid. 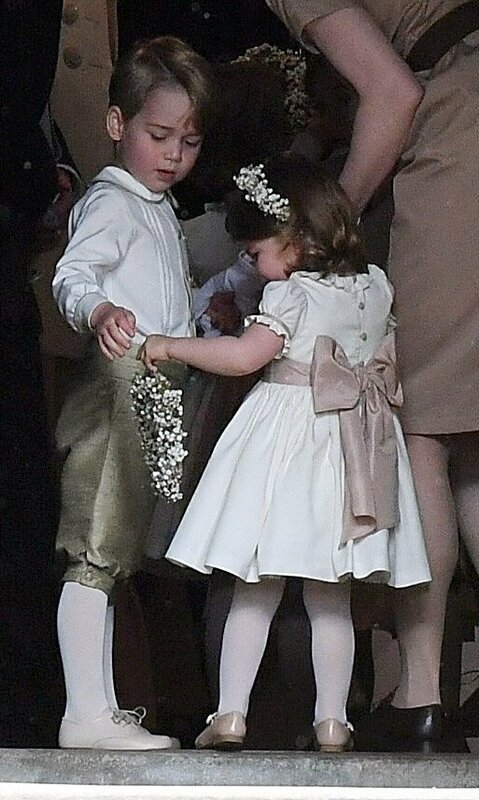 While George, who will turn four in July, excitedly played the role of a page boy or wedding attendant to his aunt. Royal fans may have been disappointed to find that Prince Harry seemed to arrive sans girlfriend Meghan Markle. There was speculation that the couple would attend the reception together, adding fuel to reports that the 32-year-old royal, and the 35-year-old actress are preparing for a wedding of their own. Spencer Matthews, the brother of the groom and star of the British reality series Made in Chelsea, filled the role of best man. Spencer looked dapper in a tailored suit and peach tie, which complimented Kate's gown nicely. Meanwhile, Pippa's 29-year-old brother James Middleton (who was accompanied by his girlfriend Donna Air) and her groom's hedge-fund business partner Edward Horner, led a team of ushers at the event. Other A-list guests seen arriving at the church included: tennis star Roger Federer and his wife, Mirka. The wedding reception was slated to be at the Middletons' family home in Bucklebury, which is seven miles away from the church. Set on a sprawling 18 acres, their estate is a dream backdrop for a wedding celebration. Michael and Carole Middleton's estimated £5.6 million ($7 million), seven-bedroom Berkshire property has ample grounds to accommodate a luxurious marquee, screened by surrounding woodland and fields, as well as the invite 300 guests. Sparks first flew for Pippa and James when they began dating in 2012. After taking some time apart the pair rekindled their romance in 2015, quickly getting engaged in the summer of 2016. The newlyweds share a love of many things, including outdoor activities, like: running, skiing, swimming and cycling.